Should I Rent a Party Bus or Limo for My Wedding? Blog > Should I Rent a Party Bus or Limo for My Wedding? Party buses and limousines both add a unique element to any big event. But when it comes to a wedding, it can be difficult to decide which vehicle is the better option. Here’s a quick breakdown of the differences between the two. Limousines are considered a luxury item, so it’s not hard to see why they’re such a popular choice for weddings. 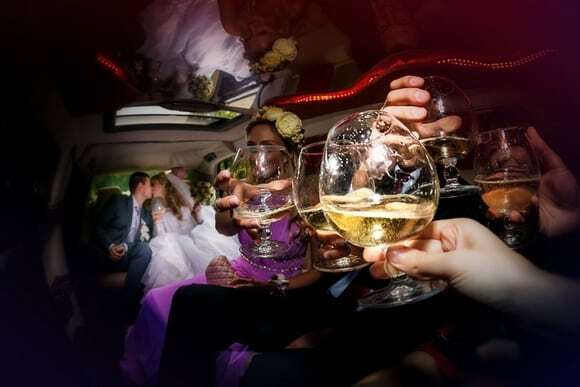 In addition to making an immediate impression, renting a limo for a wedding lets everyone in the wedding party relax in an intimate setting with plenty of privacy because of the tinted windows. Plus, many limos have cool features like fun interior lights, a sunroof, and complimentary beverages. In addition to being slightly more inexpensive per person, party buses often seat more guests than limousines. In some cases, they also offer additional amenities including TVs, light shows, sound systems, and bars. Because of their layouts, party buses have more room for dancing, mingling, and other activities. However, party buses also give off a more laid-back vibe, which may conflict with the formal atmosphere most people associate with weddings. Deciding between a limousine and a party bus often comes down to which style best suits the wedding. A formal occasion is best kicked off with a stretch limousine, which lends a more dignified feel to the proceedings. A more relaxed wedding may be better suited to a party bus, which can get the party going from the start. For the best of both worlds, a limo can drop off the wedding party at the ceremony, and a party bus can bring them to the reception and the after party. When it comes to deciding between a limousine and a party bus for a wedding, it’s all about matching your transportation to the occasion. Echo Limousine is one of the most reputable car service companies in Chicago. We have years of experience handling weddings, bachelorette parties, and other significant events. If you’re still not sure about which kind of vehicle to rent for the big day, text or call (773) 774-1074 to contact a member of our staff.